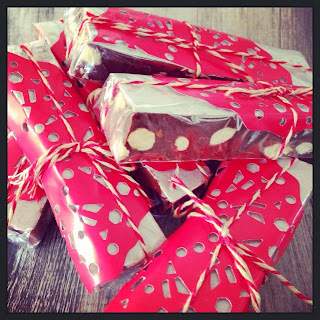 Nat's Thermomixen in the Kitchen: Choco-latte Nougat with Roasted Almonds | Thermomix nougat! 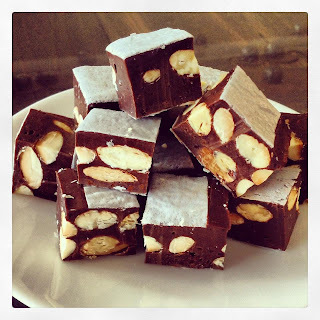 Choco-latte Nougat with Roasted Almonds | Thermomix nougat! I've tried a few different Nougat recipes and techniques in the Thermomix, but I think this is the best! Credit for the basic nougat recipe goes to my awesome Thermomix Group Leader, Trisha, who developed the Nougat recipe on Recipe Community. I've changed the ingredients a little to come up with the Choco-latte version. You could do the same...what flavours could you come up with? Add nuts, mix for 10 seconds, reverse speed 2 or until combined. Alternatively you can place your nuts in the bottom of your dish, and pour the nougat mixture on top. For the next stage you need to move QUICKLY! Pre-boil a full kettle of water to clean jugWipe over your TM spatula with oil, to stop the mixture sticking as you work with it. Scrape and pour the nougat mixture into your pre-prepared dish. You may need to have a butter knife handy to help you scrape the mixture off the spatula as you go, as it is extremely sticky and stretchy as you are working with it. Cut into squares or long bars once set, and try not to eat the whole lot at once!